A Walk through Ridgecrest /Hawks Aloft Inc. I recently had the pleasure of housesitting in Southeast Albuquerque, near Nob Hill in the Ridgecrest area. A far cry from where I reside in East Downtown, this neighborhood is comparatively lush with trees, birdfeeders, sprinkler systems and birds. In my neighborhood, the list of bird species that I’ve tallied is fairly minimal—mostly species of dove, namely Rock and Mourning. During my time—and the many walks I took with the dog in my care, Pegasus—I was pleased to spot a few common birds that I don’t often see in my neighborhood. I was happy to see among these a Downy Woodpecker. As Pegasus and I ambled through a pocket park (of which there are many in Ridgecrest) I heard the staccato cheeps of the bird less than four feet over my head in the low bough of a small tree. 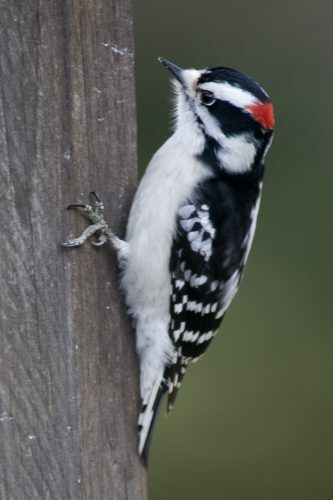 Easy to identify, with their checkered black and white wings and a flash of red on the head, I was thrilled to get a close look at the woodpecker before it no longer tolerated the presence of a human and an excitable dog, and flew off. As we strolled down the sidewalk of a residential street, I noticed movement in the bushes that bordered an adobe wall that separated the street from someone’s yard. Pausing, and carefully looking into the scrubby foliage, I saw a round-chested gray bird with yellow eyes flitting about, and then pausing to anxiously look back at me. 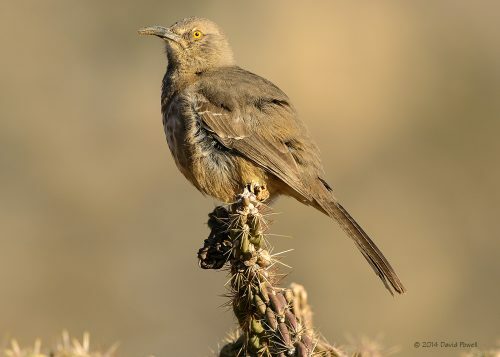 It was a Curve-billed Thrasher, which I have had occasion to see in the foothills, but not often in a more urban environment. 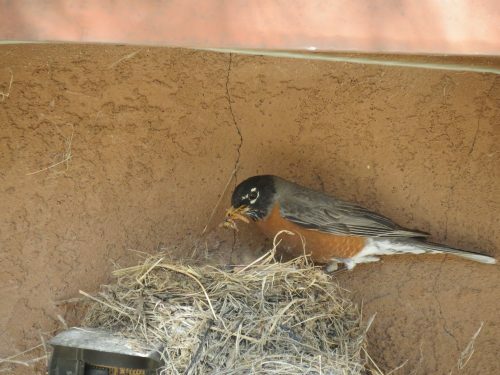 The most widespread of western thrashers, this species can make their home in a variety of terrain, which explains its welcome presence in many a yard throughout the city. not only in urban environments, but also in open woods and desert thickets. wherever that may be. A walk down local streets, taking time to pause and appreciate what’s common, may present a moment of realization of how amazing it is to coexist so closely—in our own yards and neighborhoods—with such diverse and interesting species of animal. What birds have you seen in your neighborhood lately? Maggie Grimason is a writer and editor at Hawks Aloft.